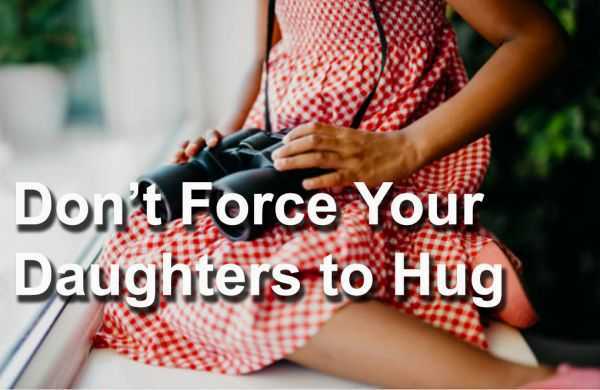 Right before Thanksgiving the Girl Scouts of the USA released a statement asking parents to restrain from forcing their daughters to hug and kiss other family members. As soon as I read it I wanted to jump around and give the entire Girl Scouts movement a massive high five – because we ALL need to hear this. This year we have started to see a huge shift in talking about sexual harassment and assault, and while there is a lot of work to be done to make real change, we can start by giving our future generations the tools to make a huge difference. I talk to my kids about consent a lot. It probably comes up at least once a day, most likely more, but I usually don’t ever explicitly use the word “consent” with them. Mainly because they are all under four years of age, and have no concept of the real meaning of this word yet. Instead we talk about giving each other space, about asking before taking something from another, and also about asking before giving and receiving affection. It works both ways: the one giving the affection should be doing it because they genuinely want to, but the one receiving affection should also want it in return. I have a hugger who likes to cuddle and kiss and hold hands, and I have a more reticent one whose hugs are more sparse, but always candid. I remember back when I was a kid we were expected to kiss and hug other family members as a greeting, as it was seen as a sign of respect towards our elders. I vividly remember not always wanting to, or feeling like it was a chore, especially with certain people who had upset or hurt me before. Sometimes I didn’t want to kiss someone who scared me or made me feel uncomfortable. Sometimes I just really didn’t feel like it. It didn’t matter if I loved and respected the person or not, I just didn’t always want to kiss someone. I’ve always been very much aware of how important having my personal space is to me, and being told I had to hug or kiss someone made me sometimes feel a little resentful, as if I weren’t in charge of my own body. I would never tell another adult to hug or kiss someone else, so why do we do it to children? As adults we don’t expect a hug or kiss from a peer when we see them, just because we respect each other, do we? I know I don’t always hug my mother when I see her, and I love and respect her dearly. My bodily autonomy was taken away from me by someone close at an early age. While I wish I had had the courage to say no, I was afraid of the repercussions saying no would have, that the fragile equilibrium of our new family would shatter. The abuser was very much aware of his actions, and this was not the first time he had done this, and he most likely had no cares about how this would affect me for the rest of my life. This means that I am hyper aware of how easy it is for something like this to happen completely undetected, and extremely vigilant with my own children. I am not saying that I was abused because my parents forced me to hug a family member, but independent studies show that letting kids decide if they want to show affection or not helps provide a stronger barrier against the threat of sexual abuse. So, while forcing a child to hug another person does not automatically mean that we are creating potential future victims of sexual abuse, it does not send the right message to our children. We are basically telling them that they don’t really have a say in what happens to their body, that affection equals respect, and that we must always accept physical affection from family members, even if it makes us uncomfortable. Instead we should teach our children that bodily autonomy is important from an early age: their body is their own and no one can force them to do anything with it. Grandma will understand that her grandson feels happier saying “hello” with a big smile and “bye” with a high 5, while Uncle will be fine with a hug from his nephew and a shy smile from his niece. All of these gestures are equally as respectful, and a lot more genuine as they come from a place of choice and not demand. Parenting is never easy, and we often feel like we are walking through a minefield. I love to cuddle my kids while I chat about silly things with them, and randomly kiss them on the cheek when they are being adorable, but often they don’t want me to. I have to remind myself to always ask first and let them come to me, and to also remind them that sometimes Mummy needs her space too. Teaching bodily autonomy not only helps our children protect themselves from predators, it also teaches them to respect other people’s boundaries and limits. The Girl Scouts of USA PSA spread like wildfire across the internet, and I loved seeing so many people sharing articles and talking about it. In the light of the #metoo movement it is all the more important that we teach our kids about consent from a very early age. However, I was quite surprised by some of the outrage I also saw in comments discussing the PSA. While our parents may not have known better, we do now, with studies backing up how teaching consent and bodily autonomy help our children understand the difference between healthy and unhealthy relationships and interactions. So why are there people who feel outraged by being told that they should let their children choose whether to give affection or not? I admit that I am very biased as I am a survivor of sexual abuse, but I would love to hear what others really think about this, and why. Feel free to leave your comments below! Jade Anna Hughes is a writer who was born in the UK, grew up in France, called NYC home for a decade before recently relocating to the California sun. Jade is currently raising three young children with her partner Cesar, and working on her second collection of essays, while preparing for a future move to Mexico.